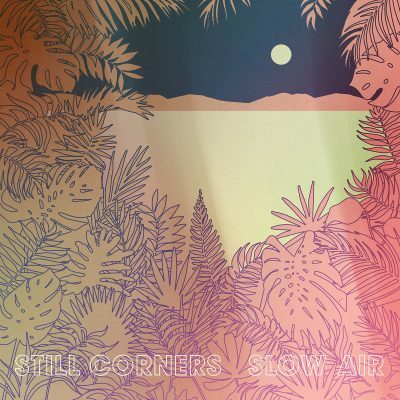 Slow Air, the newest release by the classic, indie duo Still Corners, is dreamy, meditative and washed all over with a haze that makes the songs sound like foggy memories, dreams that are hardly recollectable. This motif is present in most of their material, which will now span four albums. However, with Slow Air, Still Corners, made up of Tessa Murray and Greg Hughes, takes an earthier turn, with songs that almost pull the dream pop pair back down to the ground. The bright and coppery opening chords of “In the Middle of the Night” open up Slow Air, establishing immediately some kind of mysterious western feeling. The jangly guitar melds with the Still Corners standard–dreamy fare that has movement and vitality, but an indifferent mood that doesn’t offer to take listeners along with it. Lyrics like “I love to drive the highways, the skyways, just to get lost,” imply this careless movement, and also indicate the wide open spaces that, of course, suit a band with a penchant for galactic-synth spreads. The continued presence of warm, nostalgic guitar in “The Message” definitely indicates that Still Corners is moving in a new direction with their sound, or at least inviting in a new aesthetic. “The Message” specifically makes it easy to forget that Still Corners aren’t Los Angelenos who drive out to the desert every time they want to record, but are actually longtime Londoners. Unsurprisingly, the album actually was recorded in Austin, Texas, and in only three weeks—a timetable which the band has said they rushed into to avoid losing hold of their desert-inspired sound. It’s a sound that, after only one listen, I feel suits them and grounds them a little—though perhaps they didn’t mean to be grounded. While their albums and songs have always had the feeling of being tiny, cinematic portraits, this album has a decidedly western-noir vibe to it that spreads over the listener more easily and is more memorable. “Sad Movies” at first plays like a cliché, sad girl song, but it does well in drenching the listener in more palatable simplicity. Murray sings that sad movies make her cry and she doesn’t know why, and later on she gives out a big, deep sigh and in that four minutes implants herself into a movie. It’s a play that calls to mind Chromatics’ classic album Cherry, which is filled with these intense, cinematic moments.